The Parson Capen House sits in the historic section of Topsfield, Massachusetts, a charming New England town about 30 miles north of Boston. It is quite remarkable that this minister’s home has survived nearly unchanged since the seventeenth century. Visitors can walk in the rooms where the Reverend Joseph Capen and his family lived, and where Parson Capen undoubtedly contemplated the fate of parishioners accused and convicted of practicing witchcraft during the Salem Witch Trials. Joseph Capen was a young Harvard graduate when he came to Topsfield to lead the town’s congregation in 1682. Shortly thereafter, he built what is known today as the Parson Capen House. The date “July 8 1683” is written on a beam in the parlor, and the architecture – a fine example of the Elizabethan or English Cottage style – is indicative of the time period. It was a grand house for the time as evidenced by its size – not just the footprint, but also the fact that it is a two-story house. The house is one room deep with two stories plus an attic and a cellar. There are two rooms downstairs – the parlor and the hall – and two rooms upstairs – the chambers. A steep stairway leads to the upstairs chambers, but only the first floor is open for viewing. Step into the parlor and into what would have been one of the larger rooms in the community in the late 1600s. The parlor was used for both private and public purposes, from entertaining to conducting parish and town business. The room has been restored with period pieces reflecting its many purposes. There is a bed in the corner along with a formal dining table and chairs in front of the large hearth. Across the entryway is the hall, the only other room on the first floor. This room was used as an everyday space for the family. There is a large hearth and a beehive oven. The hall has been restored to reflect the daily life of the family in the late 1600s. Joseph Capen served as minister of the Topsfield congregation for more than forty years, including the tragic years of the Salem witch hysteria. Three of Parson Capen’s parishioners were tried, convicted, and executed as witches. A stone memorial in Topsfield lists the victims as Mary Esty, Elizabeth How, and Sarah Wildes. All three were hung in 1692. The story of Mary Esty (Estey, Easty) and her sister, Sarah Cloys (Cloyce, Cloyes, Clayes), is particularly significant for Parson Capen. Mary, Sarah, and their sister, Rebecca Nurse, were all accused of practicing witchcraft. Rebecca was found guilty and executed on 19 July 1692. We see from this petition that Parson Capen was willing to serve as a character witness for the sisters. The fact that Capen would come to the defense of the sisters against the rising tide of hysteria speaks to the character and strength of the man. Sadly, the petition did not save Mary. She was convicted of practicing witchcraft and executed on 22 September 1692. Mary’s sister, Sarah, was accused of practicing witchcraft and imprisoned for months, but never convicted. Sarah’s indictments were ultimately dismissed. Sarah and her husband fled to Danforth Farms (today the town of Framingham). They built their home there in 1693 on what is appropriately named Salem End Road. Three Sovereigns for Sarah (1985), a three-part mini-series, recounts the story of the three Towne sisters, Rebecca Nurse, Mary Esty, and Sarah Cloys. The dialogue follows actual trial transcripts. The Parson Capen House was used in the filming of the series as the setting for the home of the Reverend Samuel Parris, the minister of the Salem parish at the center of the hysteria. Joseph Capen is not depicted in the film, but we know that he ultimately chose to support his parishioners. A decade after the Salem Witch Trials, Capen and several other ministers signed a petition to the court asking that the convictions of those accused be reversed. As you tour the Parson Capen House, take a moment to imagine the minister’s anguish as he contemplated the fate of his parishioners during that tumultuous and dark period in our colonial history. 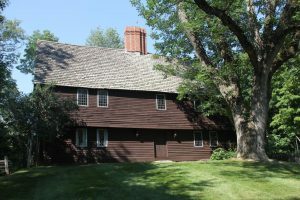 For more information on the Parson Capen House, please visit http://www.topsfieldhistory.org/parson_capen.shtml. Visit sarahclayeshouse.org for more information. Three Sovereigns for Sarah. Dir. Philip Leacock. 1985. PBS Home Video, 2005. DVD. As a descendant of Sarah (Towne) Cloyes, I thank the good Parson Capen. Marcia, I just discovered this summer that I’m descended from William Towne, father of the three sisters, through his son and their brother, Jacob. That makes them my eighth great aunts. How interesting it is to see your article about the Capen House, and to learn about that mini-series. Do you know if it is still available? I shall definitely plan to visit the Capen House some time. We did the Jonathan Fairbank House (a 9xggf) in May, which was really neat to see. You can find it on Amazon.com, and also is available at most libraries in their video (history/documentary) department. You could also order it from PBS who made the mini-series if it is still available there. Yes, it is an excellent piece of work. My ancestor was Abigail Dane Faulkner who was imprisoned with the last group to be executed, including Mary Esty, but Abigail was pregnant at the time and so was spared from that last wagon ride to gallow’s hill with the other eight prisoners because of that. By the time she had given birth, the petitions and letters to stop the madness had finally reached Gov Phipps and things were winding down, so there were no more executions after that. Excellent documentary and good for your home library. Thank you for this interesting article. Pastor Joseph CAPEN is my 1st cousin, 10x removed. I hope to visit his house one day. Welcome to Vira Brevis, Marcia. Hope to see more of you insightful house museum posts soon. I have always found this topic very interesting, so thank you for a wonderful article. Thank you, Marcia. My eighth great-grandmother was Mary Ayer Parker who was hanged as a witch in 1692. I hope to visit the Capen House some day. I am also a descendant of the Capen family so found this article very interesting. Thank you. 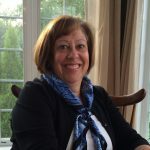 I am descended from Parson Capen, Mary Estey and Rebecca Nurse and visited the house in August of 2018. I wish I had been able to spend more time there. The docent directed me to both the victims memorial near the Common and to the Capen’s gravestones in the cemetery. Hopefully I can visit again some time.